The EM2001 consumes around 100mA @ 3.3V of current (full speed, 100BaseT mode, all onboard LEDs on). There are two ways to power the EM2001. The onboard switching regulator has the 8-20V input range and delivers enough current to power the EM2001 itself, the WA2000 Wi-Fi/BLE add on, PLUS external loads with up to 1A of combined current. To use the regulator, connect the power source to the power jack or GND and VIN pins. The power jack and GND/VIN are wired in parallel, with no diodes or any other circuitry between them. The regulator has a single diode in front of it. 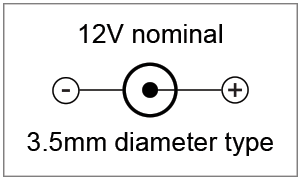 The diode will protect the regulator if the power is accidentally connected in reverse. External loads can be powered through the 3.3V pin. When the board is powered through the regulator, this pin serves as a power output. Up to 1A of current is available with the WA2000 installed, 1.3A available if the WA2000 is not installed. It is also possible to power the EM1001 through the GND and 3.3V lines. In this case the 3.3V pin serves as a power input and the regulator is bypassed. The 3.3V power source should be regulated to at least +/-10%. Proper external reset is not required. The EM2001 has a reliable power-on reset circuit with brown-out detection. Optionally, you can connect a reset button or some other reset-generating circuit to the RST line of the EM2001. This will allow you to generate external resets. The RST line has active LOW polarity. If you are not using the RST line you can leave it unconnected. The clock speed can be changed programmatically, via the system (sys.) object. For more information see "TIDE and Tibbo BASIC Manual".